Ruby Leete is a well known name in women’s football in the north of Queensland. 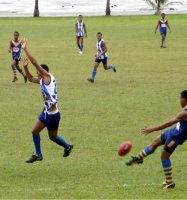 The Papua New Guinea born star grew up in Port Moresby and moved to Australia in 1996. Once settled in her new home of Cairns, she soon picked up the Aussie sports bug, first playing tennis, then netball, then rugby league. However it was only in 2009 after someone at her rugby club invited her to have a go that she got hooked on AFL. 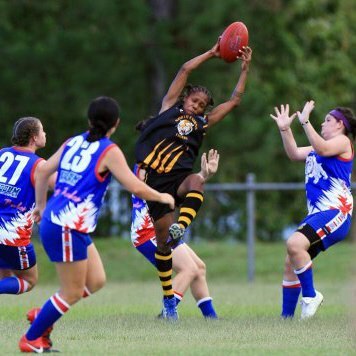 Leete learnt her trade under premiership winning team North Cairns Tigers, and supported by her netballer’s jump and firm hands, the club continued to dominate week after week in the growing Cairns league. However, after playing for the Tigers for two seasons, Leete eventually decided to switch to her current team, South Cairns Cutters. Leete was hoping to try out for the Queensland state team ahead of this year’s Women’s National Championships, but unfortunately had to pull out due to injury. However, she hopes to be back on her feet in time for the International Cup.